Blackinton B1674-S Oval Badge with Panels - B1674-S - 2 3/4" x 2"
Home > Blackinton > Police Badges > Oval Badges > B1674-S Oval Badge with Panels - B1674-S - 2 3/4" x 2"
B1674-S Oval Badge with Panels - B1674-S - 2 3/4" x 2"
Blackinton B1674-S is an oval shaped badge with multiple panels. 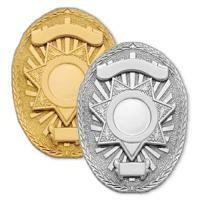 It features a layered design of a 7 point star set on a starburst trimmed with leaf edging. Personalize the top and circle panels, as well as the star point and bottom tabs, with the information of your rank and department. Blackinton Oval Badge B1674-S measures 2 3/4" x 2" and is made in the USA. Please allow 4-6 weeks for the delivery of this customized product. Oval Badge with Panels - B1674-S - 2 3/4" x 2"
©2002-2019 CopsPlus.com: Blackinton B1674-S Oval Badge with Panels - B1674-S - 2 3/4" x 2"